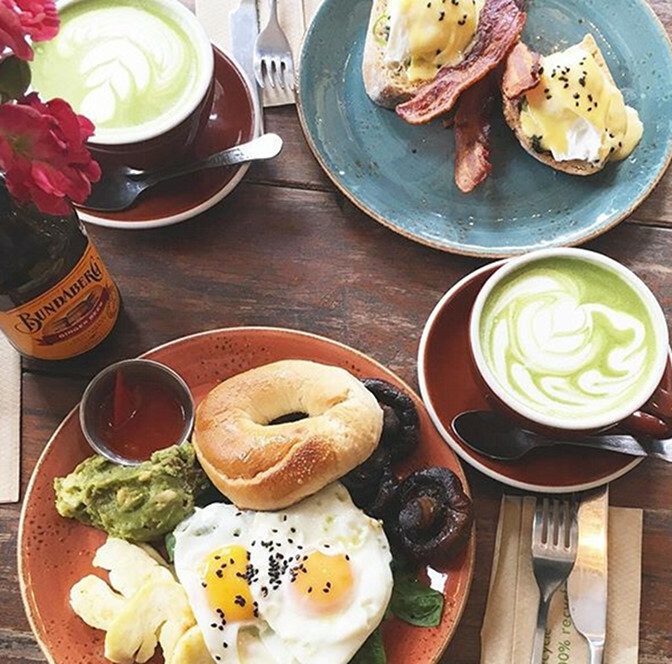 Hotspot: The 8 Best Places to Eat in Manchester | Memorable Days : Beauty Blog - Korean Beauty, European, American Product Reviews. It has been a while since I have posted a hotspot blogpost. If you have been following me on my Instagram @Kawaiipeachies you can see that I go to the UK pretty often. I just love it there, since the food industry is so big and I just love to try new foodie places! 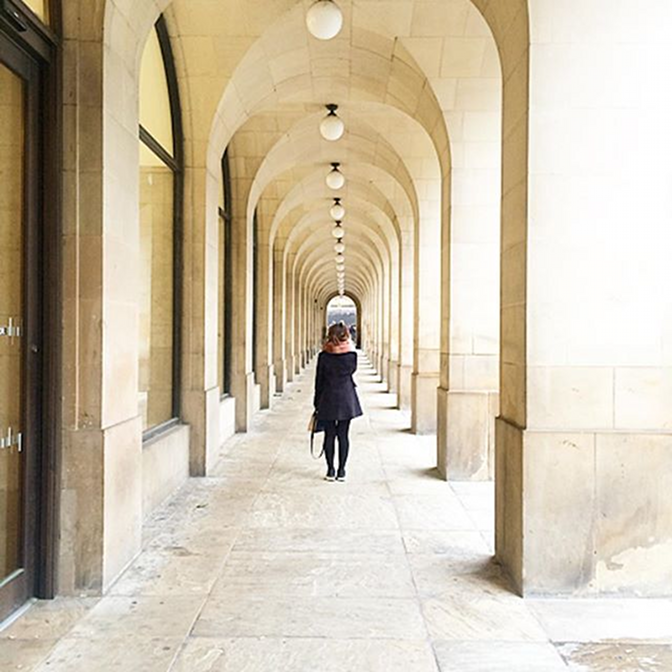 In today's blogpost I am sharing my hotspots in Manchester. If you are going there any time soon, check out these places and put them on your to go list! All these pictures were already shared on my Instagram, so feel free to follow me there if you haven't! 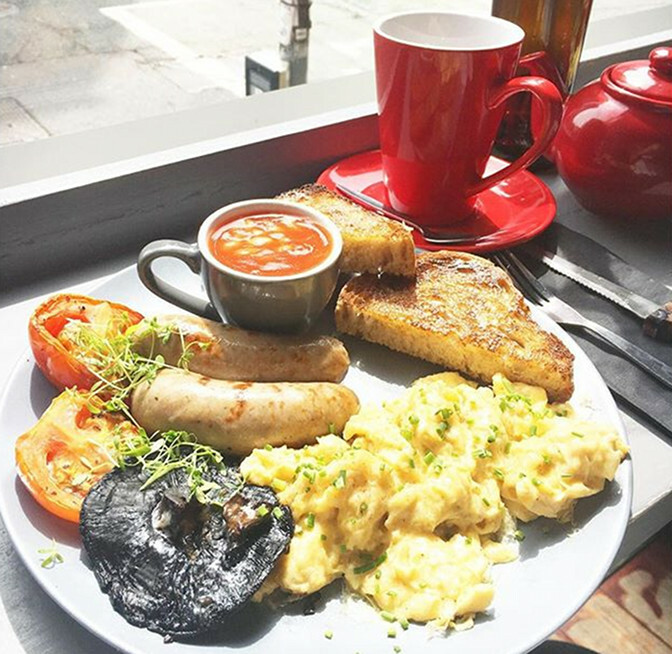 This is a New Zealand & Australian cafe in the city centre at Northern Quarter. Great brunch place and they serve brunch all day and their coffee is great. Their menu will be changed every month. Good place to start your day, they even got matcha latte there! In below pictures I took the halloumi & shrooms and veggie breakage bagel. Check out their menu on their website: www.federalcafe.co.uk. This is an espresso and brew bar. If you are a coffee lover this is the best place to have a fresh cup of quality coffee and chill. The vibe is very relaxed here. I wasn't really up for coffee so I just grabbed one of their teas. They serve it in gorgeous cups and create pretty latte arts when you grab a coffee! For the hungry ones, they also serve sandwiches there. 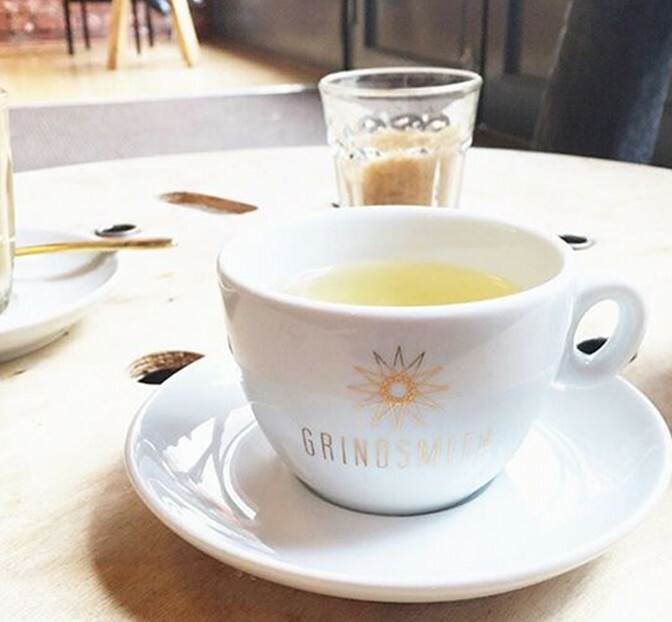 Check out their website for all their locations: www.grindsmith.com. Cha Kee is definitely one of my favorite places in Manchester. 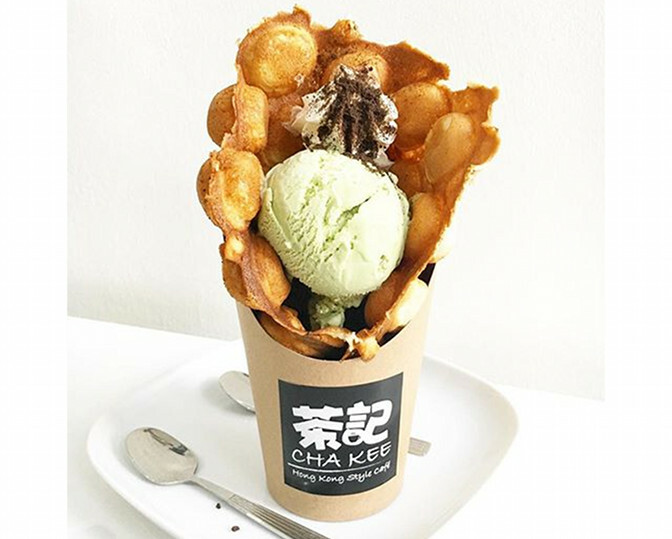 It's a Hong Kong Style cafe where they serve many Hong Kong snacks such as these egg puffs with matcha ice cream! One of the best I have tried, such a pity that they don't have this here in The Netherlands. They also serve sandwiches and waffles. Go to their website for their menu: www.chakee.co.uk. TAKK Coffee house doesn't only serve fresh coffee but it's also a lovely brunch place! This place is at Northern Quarter. 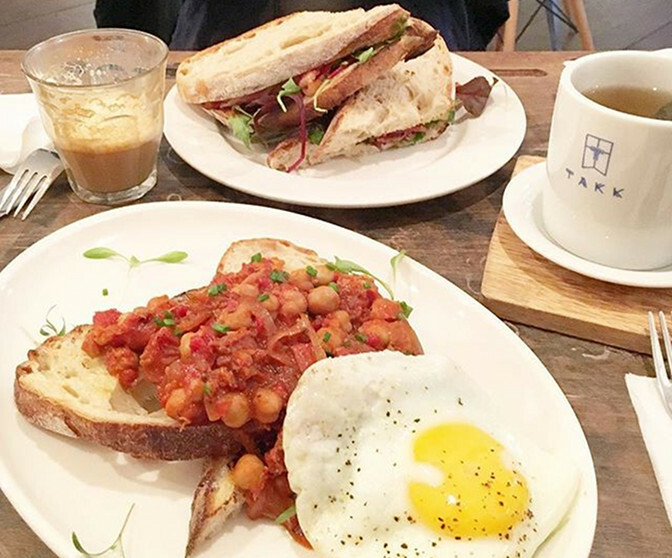 My boyfriend had the TAKK Sandwich and I had the House beans on toast. Price wise it's pretty cheap, everything priced at 5-6 pounds. Their menu is pretty small but it's still good! Check out their website for their whole menu: www.takkmcr.com. Another place at Northern Quarter is Ezra & Gil! Ezra meaning 'Helper' & Gil meaning 'Happiness' is an evolutionary concept in urban coffee, cafe culture and general provisions. They got some quality coffee and it's an amazing brunch spot! I really loved their full breakfast there, plenty of space for you to sit too. Go to their instagram to check out their space. 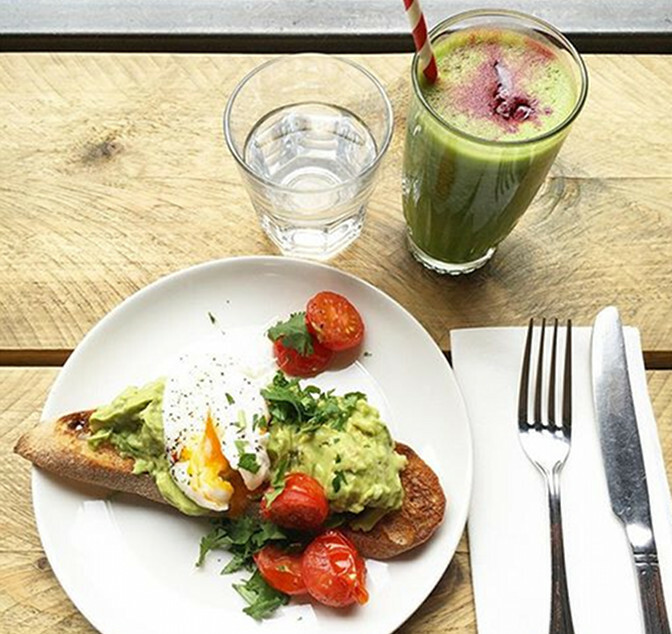 I was in the mood for some healthy food, so I ordered a green smoothie and poached eggs with smashed avocado and tomatoes on toast at Evelyn's Cafe & Bar. I love the interior in this cafe, and this cafe looks more high class than the other cafe's which is why the prices are slightly higher too. A normal dish for brunch is around 7-8 pounds. The smoothie was 4 pounds. However, I gotta say that the service is very good too at Evelyn's. Check out their website for their whole menu: www.evelynscafebar.com. I love the name of this place: Home Sweet Home! They got two locations and we went to the one at Northern Quarter. Their menu contains waffles, burrito's, poached eggs and more. 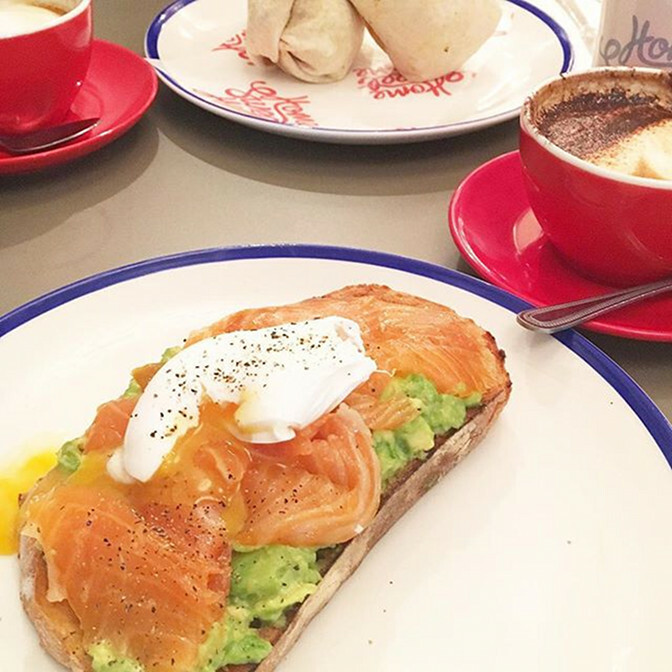 As you can see I ordered poached eggs with smoked salmon, smashed avocado on a toast. Their burrito's are really good too, gotta try when you are there! Everything is fair priced from 6-9 pounds. Check out their menu on their website at: www.homesweethomenq.com. It's always so packed at the bar Gorilla and I am not surprised. It was the bar of the year in 2013. Their menu is big, so it took me a while before I knew what I wanted. 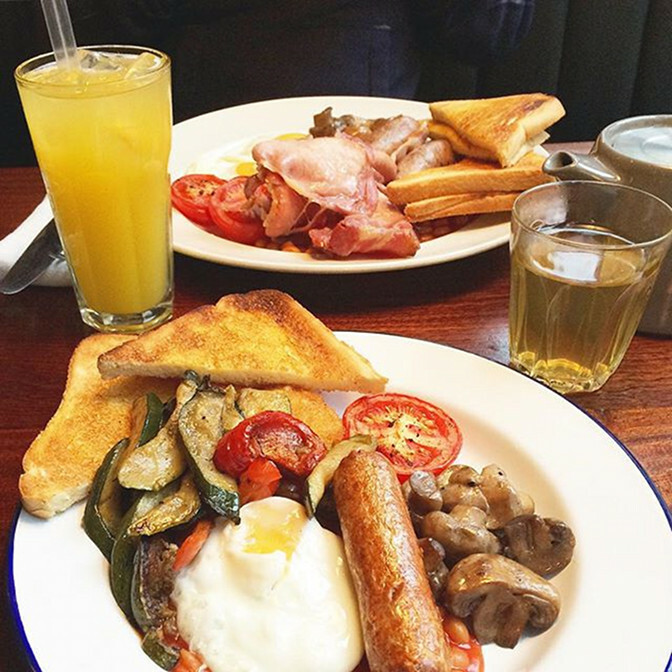 Eventually I ordered the Vegetarian breakfast, which tasted great! A really recommended place for breakfast & brunch. They are priced at around 8-12 pounds which is pretty pricey compared to the rest. They also serve burgers but I have never tried them. For the whole menu, check out: www.thisisgorilla.com.